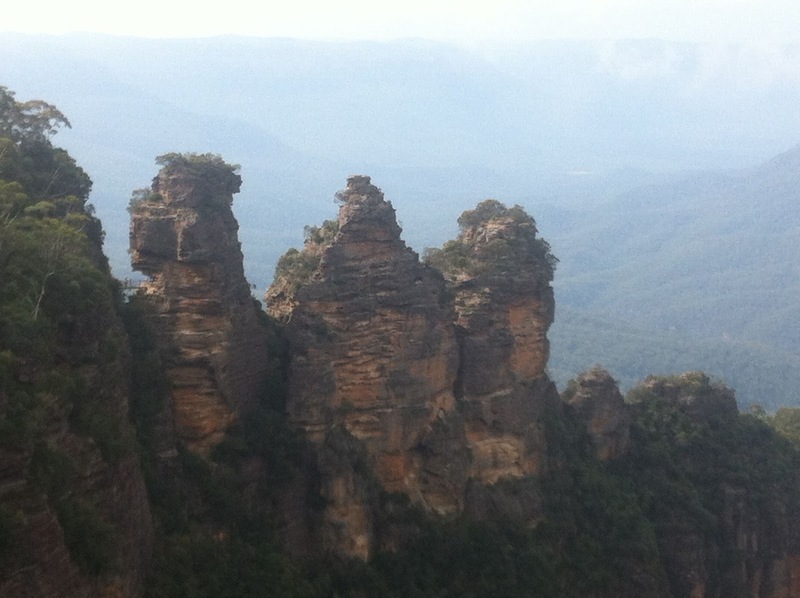 As a bit of a family getaway we booked a weekend away in the Blue Mountains late last year. It was so long ago that Leonie and I had almost forgotten all about it. Nonetheless we soon were planned our weekend and what we wanted to see and do. 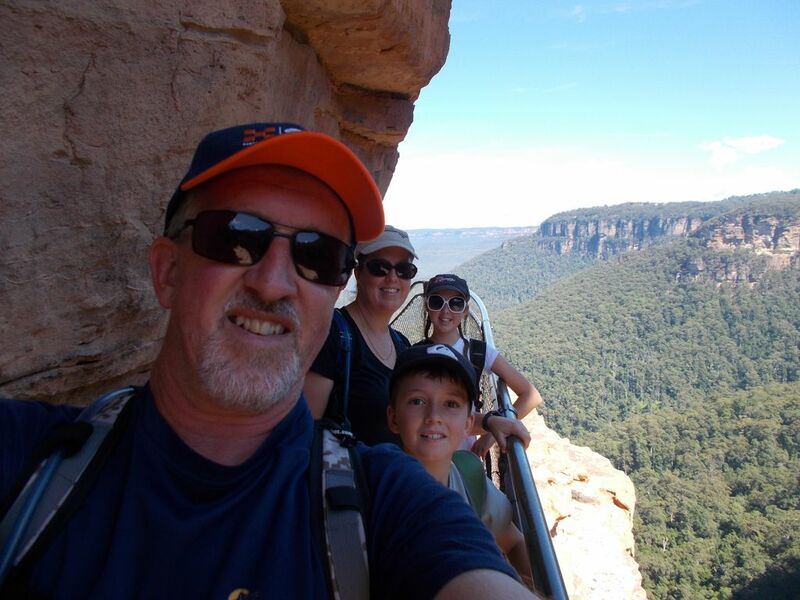 I was keen for some family bushwalks while the kids wanted to check out the IMAX cinema. Perfect weather greeted us as we headed out west early on Saturday morning. 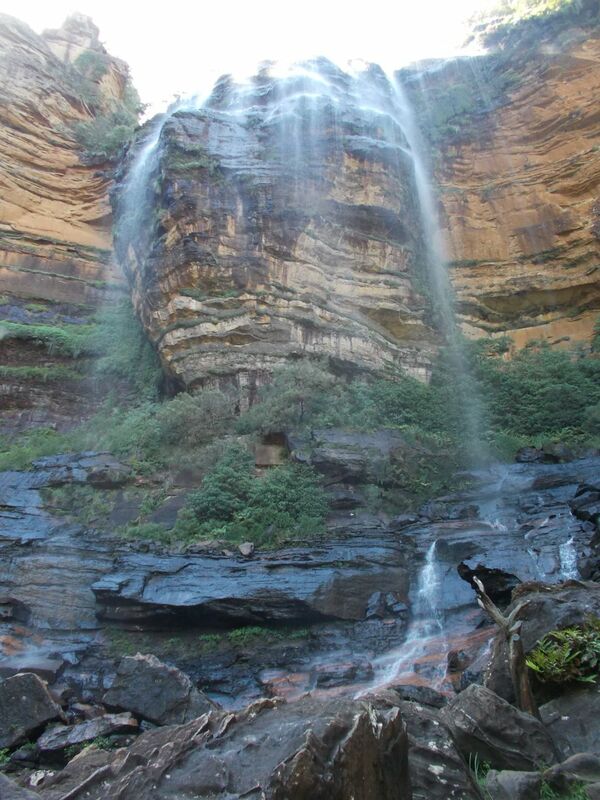 Our first stop was Wentworth Falls where we found ourselves at an overcrowded lookout. Knowing the crowds wouldn’t be where we were going we set off on our first walk. 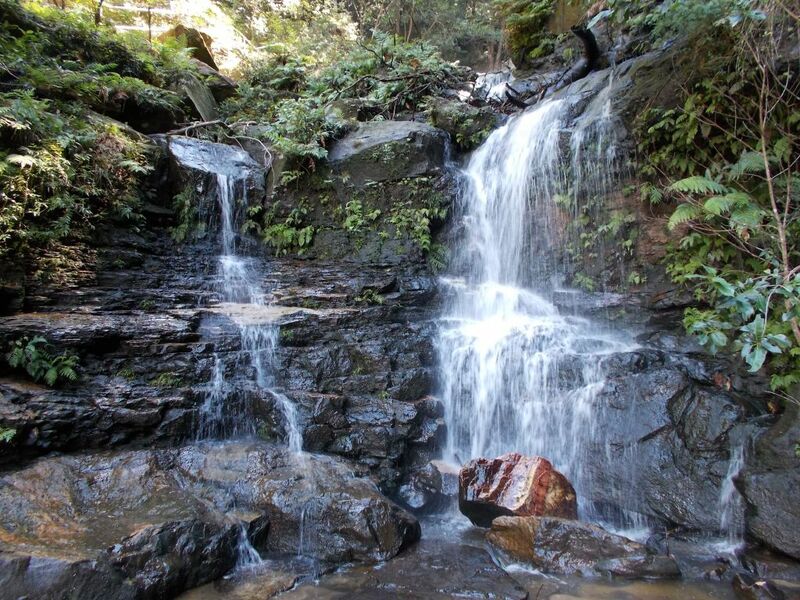 For years I’d wanted to head down the National Pass and explore the Jamison Valley. The initial part of the walk was relaxing as we headed along the clifftop and over a number of small creeks, then all of a sudden we were heading down the very exposed sandstone steps which hugged the cliff wall. Every few metres we would stop to admire the vista and magnitude of this pass. We couldn’t imagine how the trail blazers of the area had managed to cut a path into the side of this sheer cliff-face. After numerous stops and countless steps we were at the bottom where the beauty of the Wentworth “falls” could be appreciated. Like others, we stopped here for a bit of lunch and the kids paddled their feet in the cold water. Others around us were keener than us using the waterfall as a place to cool off. Moving on we traversed the lower cliff track towards the “Valley of the Waters”. The walk offered amazing views of the valley and memories of when I use to travel through the valley for work. In what seemed like no time but was actually 90min we were at the base of Empress Falls. Here we got to watch a few of the commercial canyoning groups’ abseil down the 30m waterfall having completed the picturesque Empress Canyon. The walk from here was a little demanding but we soon found ourselves back at Conservation Hut and then finally back at the car. I was so proud of our 6km family walk. Continuing further up the mountains we soon found our accommodation and checked-in. The kids were buzzing with excitement at the prospect of staying in a motel for the night. 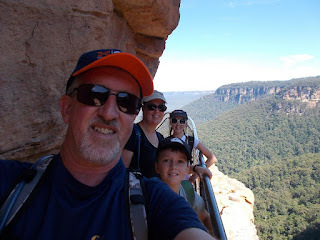 After getting comfortable we headed into Katoomba where we picked up a few supplies and checked out a few tourist spots. We’d decided to have dinner out but to our detriment so had everyone else in town, Katoomba was packed and every restaurant informed us of the 30-40min wait just to get a seat. Apparently the 6-foot marathon was on leaving the town packed with people making a weekend of it in the mountains. In the end we chose to get some takeaway pizza and headed for a secluded lookout where we watched the sunset over the 3-sisters. Sunday morning we were all a little stiff but I offered some good advice and we were soon headed out for our second walk of the weekend. Heading to Echo Point we joined the mobs who flock to this spot for that special photo. Leaving the crowds we headed around to the “Giant Staircase” and after a short walk we were standing at the base of the first “sister”. From here our trek took us down the 700 steps to the valley floor, once again we were amazed at the people who built these risky tracks and stairs….. It appeared that many of the people of the track seemed to be doing the walk the wrong way, why would you climb up these stairs unless you were a fitness junkie. Once at the bottom the trail snaked its way around the spur of the 3-sisters and along the valley floor. No sooner did we start than we found ourselves at the base of the Furber Stairs and then the “Scenic Railway” where we chose the easy option of a train ride on the world’s steepest train line back to the top. The kids were keen on the front car and the thrill of looking out at the vista as we made our way up the incline. The quick trip is breathtaking and we’d soon completed another 4km walk in the mountains. A short bus transfer had us back at the car and our time in the mountains was coming to an end. So many memories of my childhood growing up in the mountains and doing family walks with my parents had been filling my head all weekend and to now I was sharing those experiences with my family which was very rewarding and special. As we headed for home I quizzed the family on what was their highlight, our answers were all mixed but there was one common response. The fact that we’d had a family weekend away.